On my recent trip to Gulf Shores/Orange Beach, I ate breakfast at Sunliner Diner. It is a fun 50s style diner with delicious food. 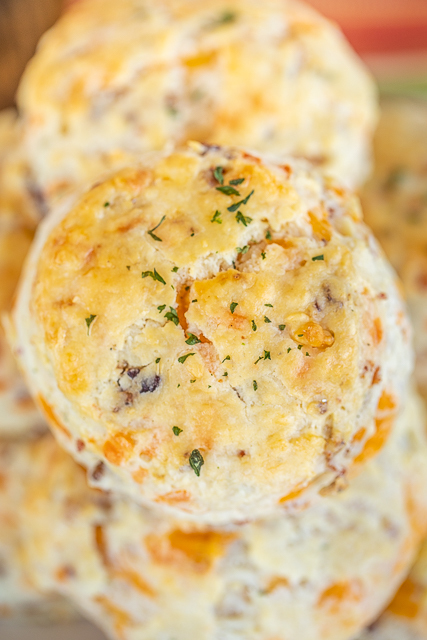 Looking over the menu I spotted a Bacon Cheddar Biscuit. I have a weakness for all things bacon and ranch, so it immediately caught my eye. THEN I saw it also had ranch. Bacon + Cheddar + Ranch = Crack!!! I had to get it. The biscuit at Sunliner Diner was so good. It wasn't very pretty, but it was really delicious. I was dying for the recipe. I was with someone that knew the owner of the restaurant, and they were able to get me the ACTUAL recipe from the Sunliner Diner chef! OMG!!! 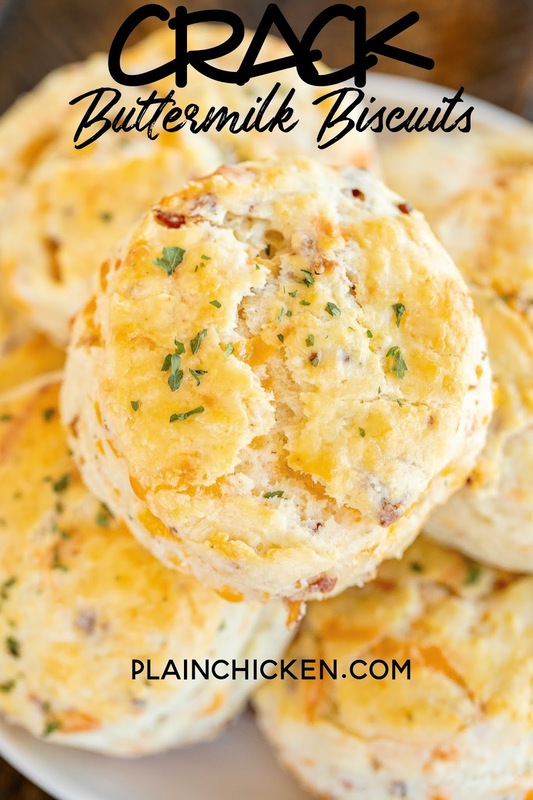 I made these Crack Buttermilk Biscuits last weekend and they were AMAZING! I'm not going to lie. I think mine were better than the original. The Sunliner Diner biscuit maker better watch out! I'm gunning for their job! LOL! I was surprised at how easy these Crack Buttermilk Biscuits were to make. They only took a few minutes and they were ready to bake. I used White Lily self-rising flour. I also used some precooked chopped bacon (I buy it in bulk from Costco) to cut down on the prep time. Also note that this recipe uses room temperature butter, not cold butter like some other biscuit recipes. 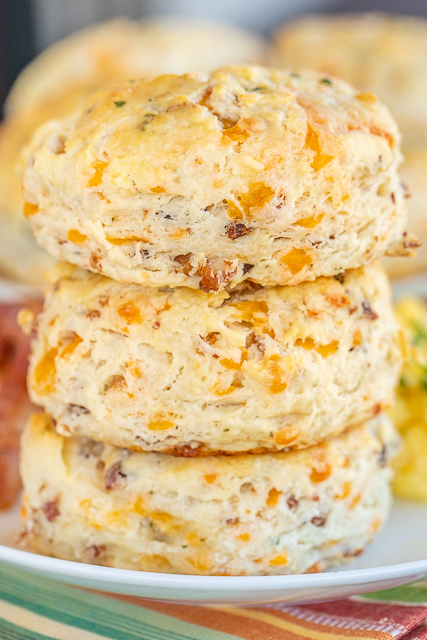 They key to getting pretty and flaky biscuits is to fold the dough over on top of itself a few times before cutting. I didn't use a rolling pin. I just used my hands and patted the dough into a 1-1/2 inch square. Make sure when you roll out the scraps to fold it over a few times. I didn't do this on one of my rolls and you could definitely tell which biscuit I didn't fold the dough over enough. It spread and wasn't pretty. It still tasted fine though! These Crack Buttermilk Biscuits are great anytime of the day. They are good plain or stuffed with an egg and more bacon. I got a dozen 3-inch biscuits. Great for a crowd! They are also good reheated the next day. I cannot wait to make these again!!! A big THANK YOU to Sunliner Diner for sharing their recipe! Preheat oven to 350ºF. Line a baking pan with parchment paper. In a large bowl, combine self-rising flour, all-purpose flour, room temperature butter, Ranch seasoning, cheddar cheese and bacon. Make sure to break up any large clumps of butter. Gently mix in half of the buttermilk into the flour mixture. Add remaining buttermilk and gently combine. Knead dough until just combined. Remove from bowl and place on a floured surface. Gently knead dough a few times, adding more flour if the dough is too sticky. Fold dough over on itself 3 times, and press to 1-1/2 inch thickness. Cut out biscuits with a 3-inch cutter. Place biscuits on prepared pan. Press together unused dough and repeat kneading and cutting. Whisk together egg and milk. 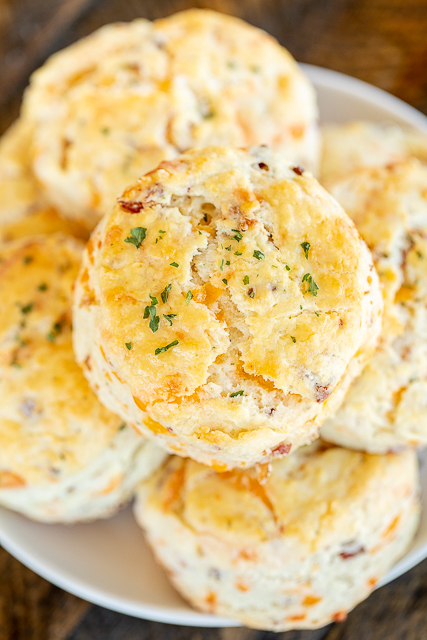 Brush over tops of biscuits. Bake for 28 to 30 minutes, rotating pan halfway through baking. Looks great. Similar to mine. Difference is that I use cake flour, not self rising, and baking powder + soda. Never tried with ranch, though. What is your opinion and reasoning for self rising v baking powder/soda? 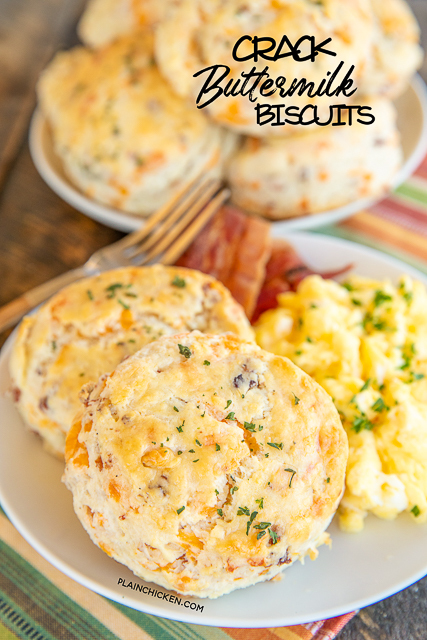 Most biscuit recipes I've seen and used have self-rising flour in the recipe. You can certainly make your own - 1 cup all-purpose flour, 1-1/2 tsp baking powder and 1/4 tsp salt. I WISH I could find self rising flour with out it being an isaine cost! Thank you for the ratio with baking powder and salt!